Well, I think this clinches it. When asked how my March break was, I can firmly say that it was un-relaxing. I can’t say that it was completely un-fun, although much of it was. Both of my boys on drugs – the little one for pneumonia, the big one for bronchitis and sinusitis. Not very good sleep for anyone… and by Thursday, despite my best efforts not to, I was succumbing to some kind of coughing/sore-throat ailment. I still have hope that I’m getting the abridged version of whatever it is – I do feel better today than I felt yesterday. Anyway, he eventually calmed down and ate his snack, and was fine for his walk in the stroller, fine at dinner, etc. It wasn’t until he complained, as I went to put his left leg into his sleeper for bed, that the light bulb went on. Thinking back, I knew he hadn’t been walking that evening at all – when I’d gone to put him down on his feet, he sat down on his bum and cried. Because he also does this when he’s grumpy, and it’s been a grumpy week altogether, I didn’t think much of it. Now I tested it out, tried standing him up to see if he could put weight on his left leg – and he clearly couldn’t. SUCH A BAD FEELING. Such mournful guilt. That’s why he was crying so much! What kind of idiot mom brushes that off?? How could I fail to notice my own toddler NOT TODDLING in the last four hours?? All useless thoughts, of course; all parents make mistakes and I’m sure the vast majority feel guilty about it, even though it doesn’t help at all. C’est la vie. So on Saturday morning, after talking to the Telehealth nurse, we set off for the emergency room. Luckily it was a pretty quiet day, so we spent a lot fewer hours there than we could have. We brought snacks, and a laptop with “Buzzwoody” (Toy Story 3) on it. It provided entertainment for several adults in the waiting area too. E was an incredibly good sport – it seemed to have sunk in that his leg was hurting him, so he didn’t even ask to get down. Some of the time he simply sat quietly, playing with my hands. The medical staff took several x-rays, which showed no visible fractures. Apparently, though, there is such a thing as a “toddler fracture”, resulting from “low-energy trauma”, which is almost invisible on x-rays and manifests itself exactly like this: pain in the lower shin, refusal to bear weight, but no bruising or deformity. I agreed with the doctor that a cast sounded like the best idea, to be on the safe side. She was really good with him, and was impressed by how good he was too. We talked all about his “funny sock” as she bound him up, first with a sock-like sheath, then with wraparound padding, then wraparound fibreglass that dries hard. (The days of plaster casts are long over, it seems.) 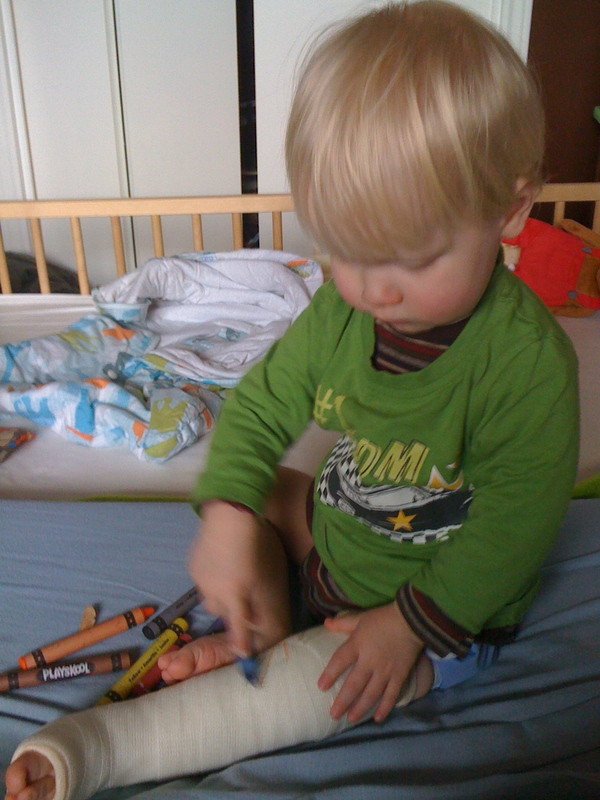 By the time his cast had dried, E was all stoked about going home to colour on it. After that, he was cool. At his request, I drew a purple cow on his cast, which he later (thankfully) scribbled over. He has remembered his rolling and commando-crawling skills of yore, and has actually been totally chipper and awesome about the experience. 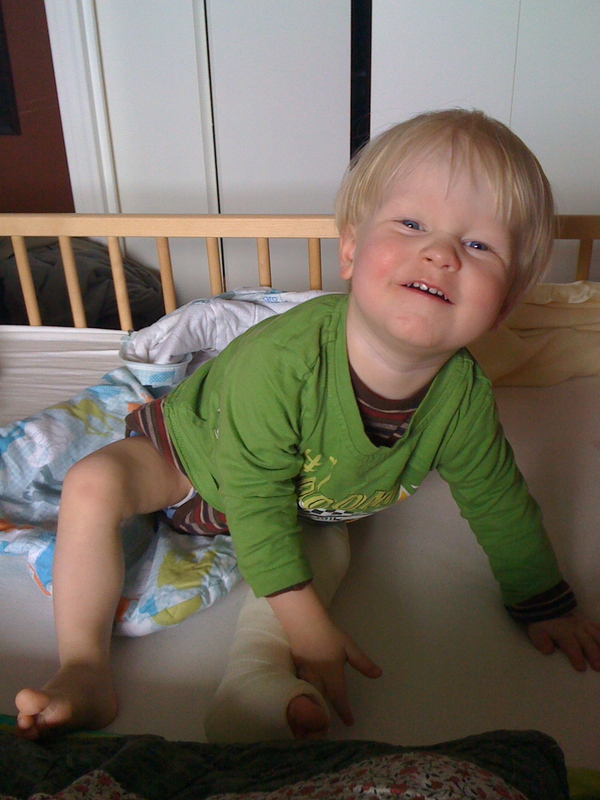 Today he’s even hobbling around on it a bit – something the doc said the cast is designed for – and he only needs help to get from sitting to standing. I have the best kid ever. Um, okay, let's try that smile again. Right. Time to DRAW ON IT, already. He looks like he’s handling everything just fine, but I’m sure he’ll be getting lots of extra hugs and kisses while he’s getting better. Be sure to add some from me! Oh poor little guy! Poor all of you – that does not sound like a very fun break. I’m sorry, but he is just so cute..even in that tiny cast. XOXOXO to you all! As my dad would say, “Now wait just a darned minute here!” This is 2011, remember? We were supposed to have put all disasters of all types and sizes behind us in 2010! I’ll come see him as soon as I can! Meanwhile, “kisses from Grammie and Papa”, please. Oh gorsh…so very sorry! 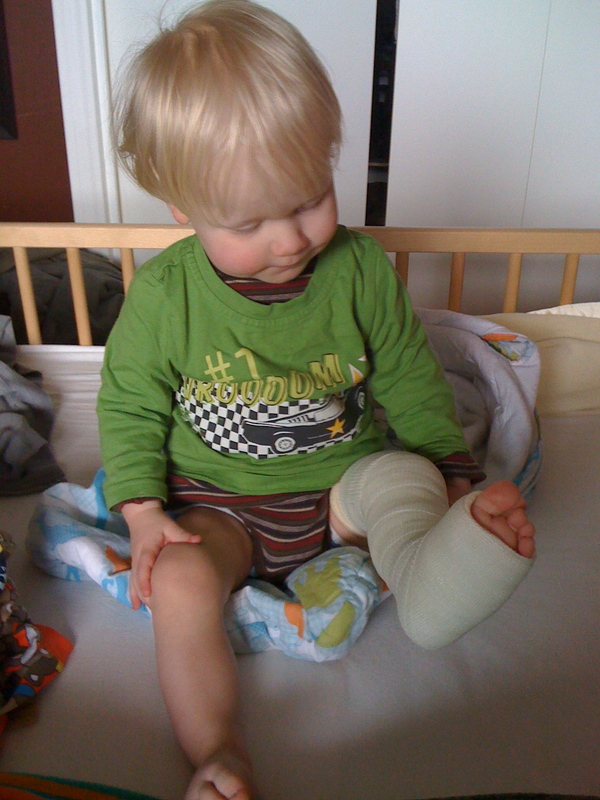 Quinn is right–he is still so cute even in a cast!!! I’ve never heard of a toddler fracture in all my years with little kids. I probably wasn’t paying attention. I had the same kind of cast when I broke my elbow and I was in total misery for two solid weeks. Thank goodness children are so adaptable and it just doesn’t bother them.I hope Sean is all better and that Spring brings you relief from medical woes. Huge hugs and kisses!!! So sorry! Barry could tell you about guilt. 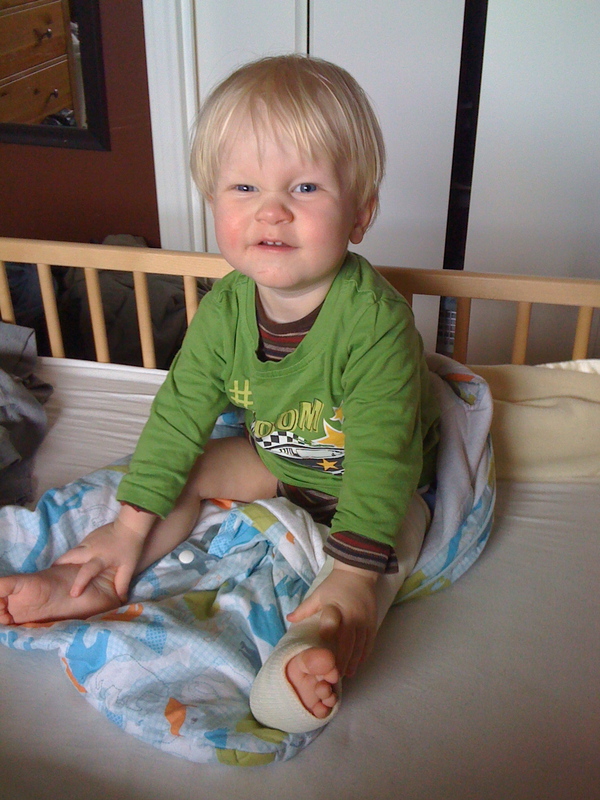 When Caleb was 3 or 4, he backed off the deck (one step down) and fractured his leg (green stick fracture). Only they didn’t realize it for a day or so. Yikes! Hope he feels better soon!